If Gardenscapes allowed you to beautify Austin’s personal backyard, Homescapes will let you restore his childhood house to its former glory. When Austin enters his tattered home, he decides to repair it even though his parents want to put the big house on sale. Austin does not want his mom and dad to sell their house and you will have to help him renovate his sweet home so that his parents change their mind and remove the “For Sale” board from the gate. 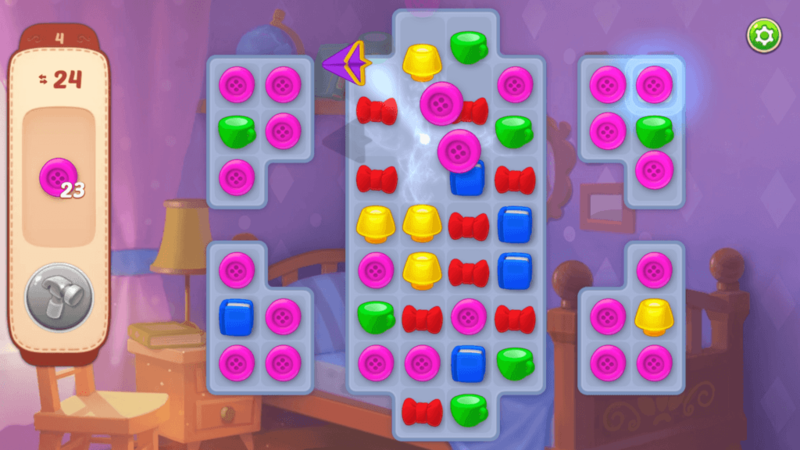 The game combines match-3 puzzles with room decoration game elements. You will have to complete puzzle levels to earn stars, and then use them to replace old furniture, carpet, wallpaper and other objects with new ones. There are several large rooms and each room provides a set of objectives that need to be completed to get a surprise gift. A To-Do list displays a list of tasks that you can complete in your own time. Match 3 or more pieces of the same type by swapping adjacent pieces. Check the objectives shown to the left side of the screen and complete them before running out of moves. You will earn a star after finishing a level successfully. Use stars to finish your house renovation objectives. Tap the To-Do list in the lower-left corner of the screen to check pending objectives. Certain house renovation objectives will require more stars. Keep winning levels to collect 2-3 stars and then complete those objectives that need more number of stars. Complete a level before the move limit reaches zero. Try to complete levels with several moves remaining if you want to get extra coins. You can change décor anytime, but you will have to spend coins if you want to switch to another object, wallpaper or carpet. In the beginning the cost of changing furniture will be lower but as you move to new rooms, you might have to spend more coins. Choosing any one of three décor pieces will be free for the first time. Make sure you select the right furniture/wallpaper/carpet so that you won’t have to change anything in future. Yes you can change if you have stashed plenty of coins, completed most levels and are looking for another makeover, but if you have just started, then try not to change décor frequently. 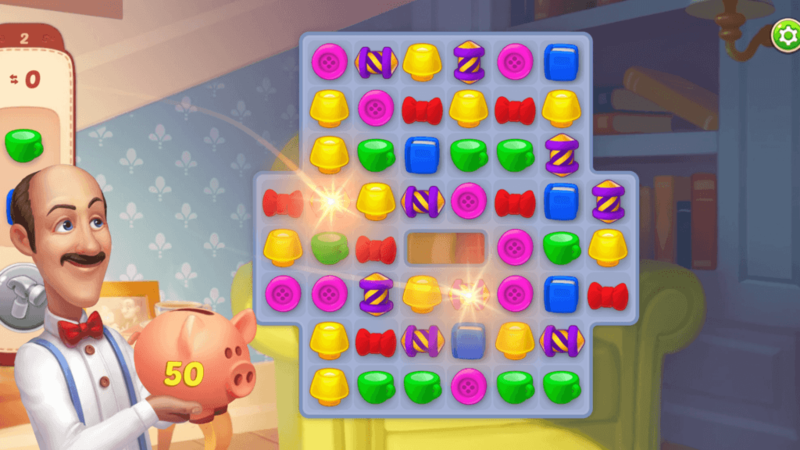 Unlike other match-3 puzzle games, Homescapes does not allow players to replay a level. You will have to play a new randomly-generated level, which can’t be replayed in the future. The stripes on a rocket power-up indicate whether it will remove an entire row or column. If there are horizontal stripes, then a row will be cleared and if there are vertical stripes then activating the rocket will clear a column. You can activate a Bomb or Rocket power-up by double-tapping it, but swapping it with a piece can help you remove a desired row or column. For example: Your objective is to clear an X number of yellow pieces and there is more number of yellow pieces on the target column. If the rocket power-up is placed on the next column, then you can swap it with a piece on the target column to clear those pieces. Double-tapping a rocket piece will activate it on the same column. Power-ups such as rocket, bomb, rainbow ball etc. allow you to remove more number of pieces on the game board. But do you know that you can combine two power-ups to create marvelous effects. All you have to do is swap two adjacent power-ups and watch the magic! Such combos will help you remove several pieces at once. Here are all possible combinations, but if you know a few more, then tell us more about them in the comment box. Combine Paper plane with bomb and the plane will fly to a random piece, remove it and explode at the same time. So basically, the paper plane carries a bomb to a random object and explodes. Similarly, combining a paper plane with a rocket will make it fly towards a random piece, remove it and a row or column will be cleared. A row will be cleared if the rocket has horizontal lines and a column will be cleared if it vertical lines are drawn on it. Combining bomb with a rocket is the best way to clear several rows and columns at the same time. When you do this, three rows and three columns are cleared in one move. Combining two rockets will trigger a cross-shaped blast, which will clear a row and a column at the same time. The cross-shaped blast will occur at the point where both rockets combine. If you combine both rainbows, then the entire board will be cleared in one move. Having two rainbows placed side-by-side is a rare occurrence. But if you spot one, then you should make the most of it. 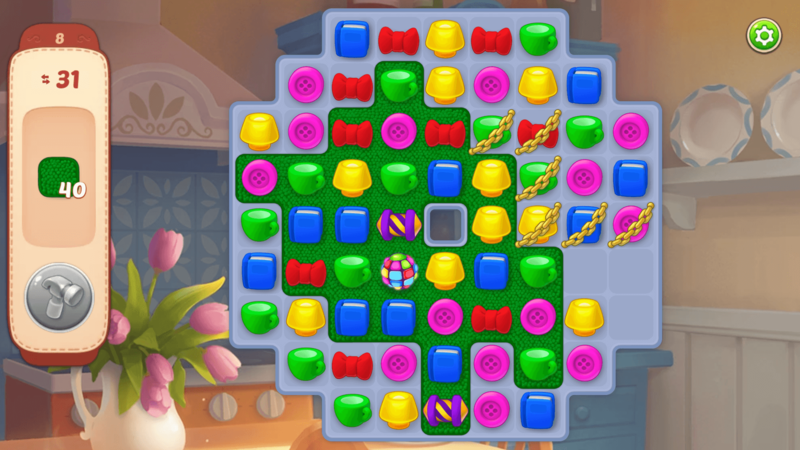 The bomb-rainbow combo is another super combination that can clear rows and columns. Try it. Also, try combining rainbow with rocket and both bombs. When you win a level, you get 50 guaranteed coins as rewards. To get bonus coins, try to finish a level before running out of moves. All extra moves will be converted into power-ups, which will be chucked at random locations on the game board. They will be activated automatically clearing several pieces at once. The more the number of pieces is removed, the more bonus coins you will earn. To-Do list on the lower-left corner of the screen and use stars to complete tasks. Once the task bar is full, you will receive a surprise gift. Connect to Facebook to get 1000 coins instantly! You will notice its icon on the right side of the screen. Tap it and press the green button to Log in to Facebook. When you don’t have any lives, you have three options: 1. Wait for 30 minutes to get a new life 2. Purchase lives using coins 3. Request lives from your friends. Of all options, number 3 is the simplest way to get lives, provided you and your friends are playing Homescapes and have connected the game to Facebook. Make sure you are connected to active players who can send you some lives immediately. Don’t forget to send some lives to your friends, whether they ask you or not. They will always be indebted to your help.